New friends, friendships formed, from stranger to fun friend, from tentative to laughter. 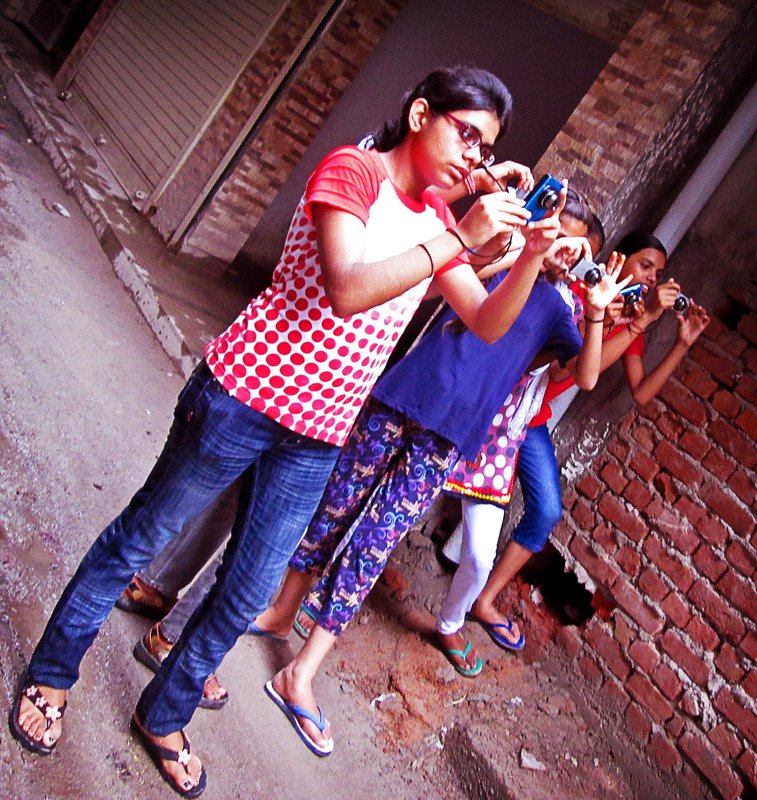 A class of kids, living in slums, given cameras, a little training and taken on walks around a vibrant but poor area. 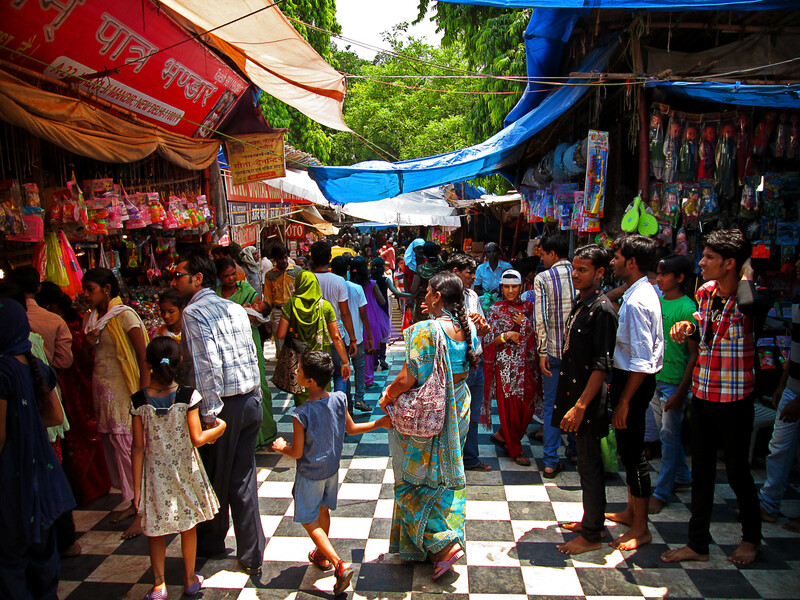 A piece of real urban New Delhi, no tourists, just everyday life. Friendships born from fun and breaking the ice, the barriers, the divide between East and West. Shy and nervous beginnings, language differences, yet as a group, photography joins together, brings together and a means to become friends. At first taking practice shots of their tutor, ending up taking shots of him to laugh at, to laugh with, back in the classroom, as he takes photos of them to make them laugh too. A few short lessons, a teacher who says, let’s go have some fun not sit quiet and learn, no longer tutor and pupils but one group of friends, taking photos, together. Another teacher, also living in a slum area, helping out, fast becomes a friend, tomorrow welcomes his new friend to his house for chai and snacks, glad to accept someone from 4000 miles away into his humble home, as a friend. In India, as in lots of countries, the first Sunday in August is Friendship Day. Delhites celebrate in their own way, buy or make their friends colourful wristbands, made from cotton threads with little gold charms on. To give one is to show someone is a friend, to receive is to know a friend, to exchange is to bond. From adults to children this new custom is being accepted, to spend time with friends, to enjoy the friendship, to show friendship. Happy Friendship Day on Sunday. 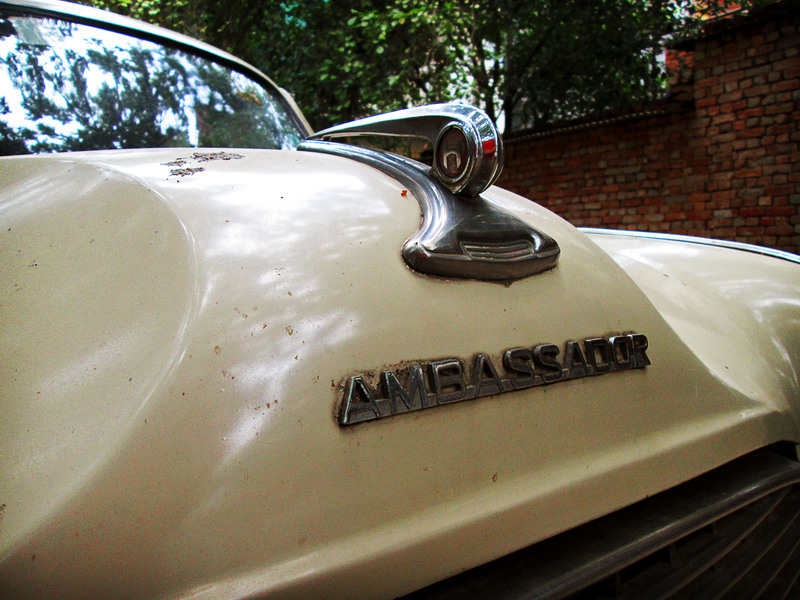 The most famous car badge in India, of the Hindustan Ambassador, the King of Indian Roads. An icon of Indian industry, an icon of government, the iconic taxi of all India until a few years ago. All over Delhi, the white Ambassador can be seen with their important passengers, from police chiefs to army top brass to government officials, sometimes with little flags on the front wing, often with tasselled curtains in the windows. No big Mercs or limos for them, a status symbol of Indian importance, Ambassador the badge of office, the badge of aspiration, a symbol of pride, of patriotism. Virtually unchanged from the old British, Morris Oxford of the 1950’s, a continual classic car show on the roads. 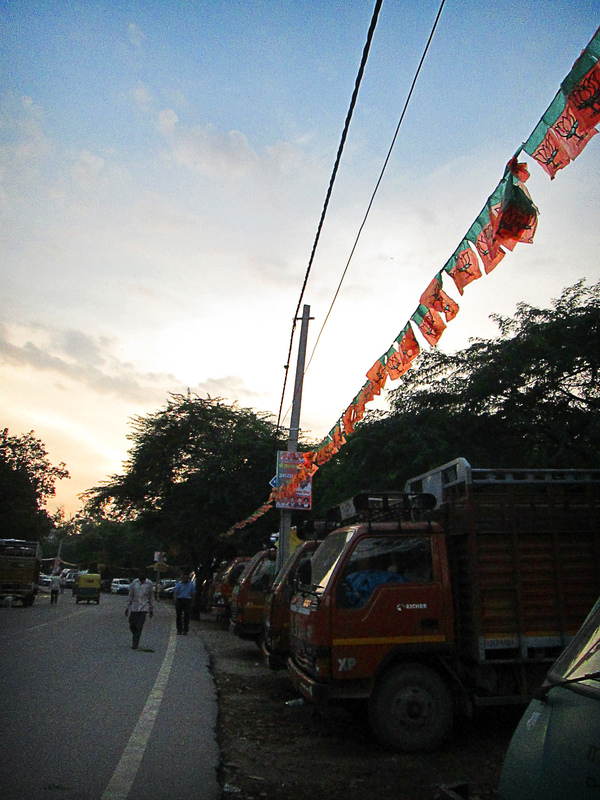 Preparations for the festival of Kanwar Mela, orange flags hang on the route, orange-clad pilgrims will follow, walk miles, carrying precious pots of holy water, pots and water must never touch the ground. Single pilgrims join together, teams string orange water pots to poles bedecked by orange flags, carry poles aloft, miles upon miles, poles only rested on makeshift sticks and trees, never to the earth must rest. On every route, orange-tented stations give rest, food, water and bandage bleeding, bare feet, replenish orange body paint. Devotees may walk hundreds of miles, from holy source to village, a test and mark of both devotion and manhood, occasionally womanhood, both young and old, devoted to bring blessed waters back to their temples. Along roads, dusty and hot, orange lines march, chanting and singing, keeping sprits up and with them, ecstatic trance, intoxicating, intoxicated by the fervour, to collapse exhausted at a resting station until the next chant goes up, then once more to celebrate, happiness once more on faces. A macro-festival, strung out along hundreds of miles, thousands of pilgrims, a micro-festival in each temple, thousands of shrines, a personal-festival, each and every one of thousands. A personal festival celebration today, festival of the day of birth, mine, another year. The Birthday Pocket-Pick at the Temple. On a special day, to Kalka Mandir temple for a birthday blessing, feeling generous, to give to the beggars outside, share a good day with them. More than beggars watching the wallet taken out, a few rupees given, eyes on the wallet and its pocket, a lapse in concentration in the crush outside the temple. Feeling hands touching, go to buy a sweet offering to be blessed…wallet gone. Of all places outside a wonderful temple, one of the oldest and most revered, one of the oldest crimes, pick-pocketing, twice in a few days. Lesson learned, feeling stupid, annoyed with self, no happy birthday just a lesson on giving. Hope somebody really needed, poor family to feed, but most probably just a bad person, a gunda. As folklore in India says, something owed to person in a past life has been given back. Day 27 – High Street. 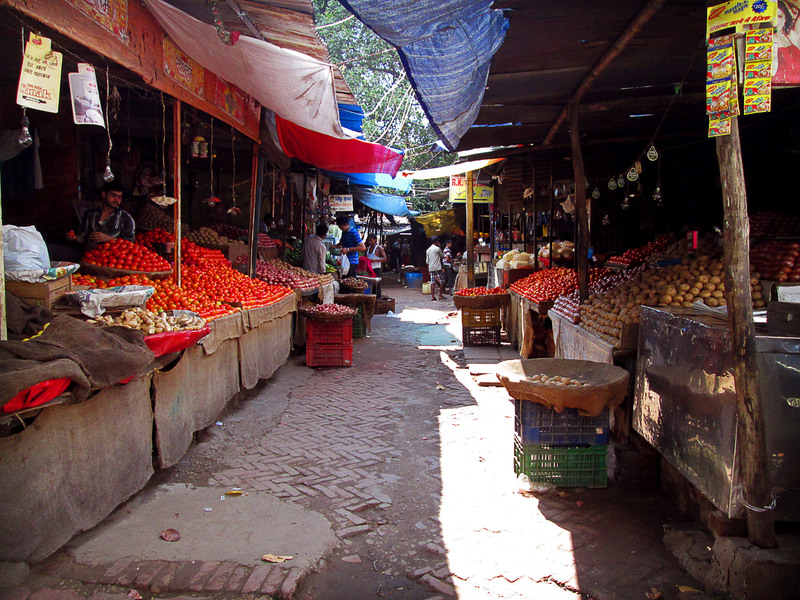 Its the main street, it has a market, it has many markets, fish market, chicken market, goat market, ladder market, clothes market, street food market, and the fruit and vegetable market, Govind Puri High Street. Lively, choiceful, fresh, to the extent live chickens will be butchered for you as you wait, fresh to the extent some fish is still live and there is no smell, fresh to the extent the veg is ripe and full and gloriously colourful and so tasteful. No supermarket blandness here. Fast food freshly prepared, healthy and safe to eat. Everything needed for living in one High Street. Before long, the laws changing, big Western supermarkets soon to come, Tesco and Walmart biting at the heals of politicians, tradition replaced. High Street may disappear, livelihoods gone, vibrancy gone, diversity gone, taste, flavour, quality, choice, what else? Gone. Watch out Delhi, lessons learned by big business, not learnt by small business or everyday shopper, the empty shops and blandness of British High Streets may come, hope may appear, the same campaigns, the same great spirit, the same imagination to bring people back, to recreate tradition, to create new ones and make vibrant once again. Repeated in another corner of the world. It is a hope, Govind Puri High Street will not disappear, will not go the same way as many, will not become victim to mass, uniform profit. Bedford, England, this weekend, shows how if the unthinkable happens there is hope for Goving Puri, India. Not just hope but success.